THE LORD OF THE RINGS. Three Volumes. THE FELLOWSHIP OF THE RING. THE TWO TOWERS. THE RETURN OF THE KING. Lord of the Rings Trilogy: The Fellowship of the Ring, The Two Towers, The Return of the King. The Hobbit, The Lord of the Rings: "The Fellowship of the Ring," "The Two Towers," "The Return of the King"
A Christian can almost be forgiven for not reading the Bible, but there's no salvation for a fantasy fan who hasn't read the gospel of the genre, J.R.R. 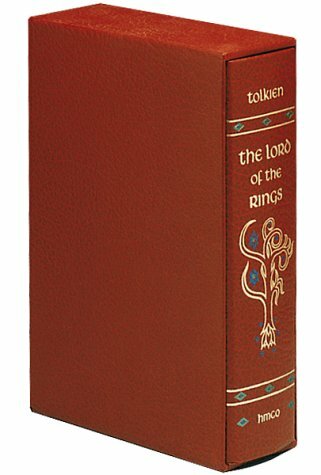 Tolkien's definitive three-book epic, the Lord of the Rings (encompassing The Fellowship of the Ring, The Two Towers, and The Return of the King), and its charming precursor, The Hobbit. That many (if not most) fantasy works are in some way derivative of Tolkien is understood, but the influence of the Lord of the Rings is so universal that everybody from George Lucas to Led Zeppelin has appropriated it for one purpose or another. 10/2/2011 Brian Urso said: LOVE the TOLK! 8/11/2011 Gail Fattori said: A hard read, but so worth it. 9/10/2010 Joseph Beekman said: Simply amazing! 8/16/2010 Robert McFarland said: I have read the Trilogy 3 times over the last 20 years,and each time I have come away with a feeling of awe at Tolkiens gift of writing and creating such a detailed world. 5/19/2010 Rachel Ziebarth said: Who can't love this? 8/9/2009 Rafaela Perales said: Classic lessons of good and evil, right and wrong, friendship, loyalty, and responsibility. 8/1/2009 Rachel Heston Davis said: My favorite book. 5/21/2009 Pamela Kevern said: Excellent writing, of course. Great imagery and story plot! 1/9/2009 Jc Scott said: One of my most favorite books of all time. A true masterpiece that cannot be compared with any other! My father's favourite series in his youth, given to me in mine; quite likely the single most inspirational work I have ever read, solely in relation to my own writing career. Unfortunately, that carries over into both Tolkien and mine tendency to be verbose to the point of distraction; regardless, a book which should be read by anyone between the ages of 11 and 101. 10/24/2008 Veronica Holden said: This is the edition I own and I enjoy it greatly. LOTR is still one of the best fantasy every written, despite having been mangled on the big screen. 4/11/2008 Kamal Lathar said: Probably the best set of fantasy book I have ever read, and certainly the only series I have read more than once. Considering the last part, I could not rate a set of books higher than that.